Piece Apparel Bill Murray sweatshirt over an LF blouse, J Brand ‘Maria’ skinnies, ALDO ‘Istrago’ heeled sandals. Sandro Paris purse, Gorjana rings. Who doesn’t love Bill Murray? Not only is he an accomplished actor who’s consistently made audiences laugh and truly think since the ’70s, but he’s also proven to be one of the most mysterious and spontaneous members of the SAG. It won’t take you much time lurking on Reddit to discover elaborate stories about Bill Murray’s wild nights with unassuming fans who are left baffled by the actor’s nonchalant sense for adventure, and his apparent ability to disappear out of thin air. Between his hilarious days on SNL, to his tender moments with Scarlett Johansson in Lost in Translation, to his roles in the wacky world of Wes Anderson, I was so stoked to see that Piece Apparel included Mr. Murray in their “Old Man Crew” collection of sweatshirts, which also honors men such as Rod Stewart, Jerry Seinfeld, and Johnny Cash. With respect to Bill’s affection for the unexpected, I decided not to pair my oversized sweatshirt with boxers or my TV remote, and instead dressed it up Sunday-brunch style. In my experience, brunch isn’t such an obviously glamorous occasion. It’s usually a group of hungover friends peeling themselves off their mattresses in the interest of good food, good stories from the night before, and, questionably enough, more drinks. That being said, Instagram and other social media outlets have deemed brunch the official favorite activity of “betches,” and, fortunately or unfortunately, an obligatory photo op. Brunch-obsessed consumers have prompted fashion magazines to address brunch outfits on the regular, and they typically suggest flouncy, frilly ensembles that seem more appropriate for an old-fashioned tea party or somebody’s baby shower. So, if you’re like me, and tend to wake up on Saturday and/or Sunday morning lacking the energy to mix joyful prints, or just want to be more comfy than you ever could be in a strappy sundress, try dressing up your favorite sweatshirt or tee with forgiving stretch-skinnies, a statement bag, and a bold lip. 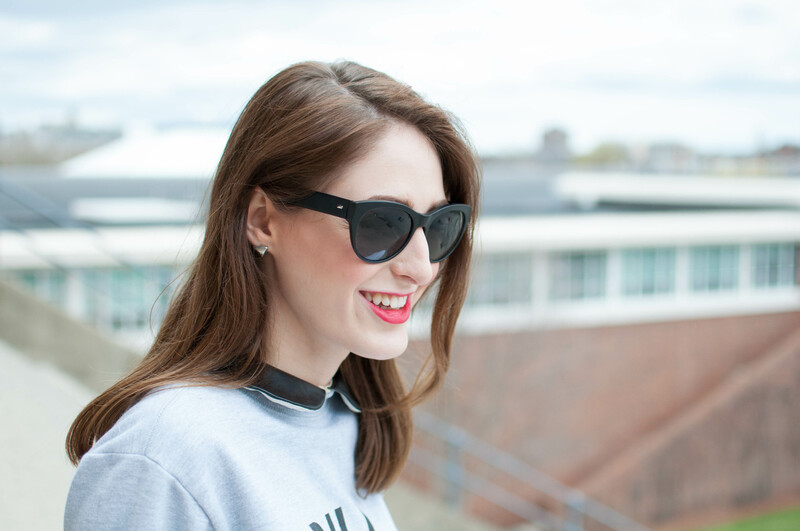 (A good shade of lipstick and big sunnies are the best tools for looking polished when you’re feeling less-than.) I think graphics with a sense of humor, like these other witty tops by Piece Apparel, make the perfect palette for a look that’s chic, but not too serious, which is exactly how brunch should feel when you’re doing it right. For those who feel confident in their styling abilities, add a statement necklace or a Peter Pan collar to further elevate your look. As for shoes, go with something comfortable but sleek. While I personally find these ALDO heeled sandals light as air, if the idea of walking in heels after a long night out makes you want to crawl back under the covers, just reach for your favorite pair of ballet flats or slides.